There's a new global development bank in town. And whether it stands to threaten or bolster the long entrenched World Bank and IMF, its presence will likely change the dynamics of development financing for the world. The BRICS -- a bloc of the emerging economies of Brazil, Russia, India, China, and South Africa -- announced last summer that they were founding a "New Development Bank" to compete with Western-dominated financial institutions. Each country has contributed $10 billion to the pot for financing development projects, much like the World Bank currently does. Colloquially termed the "BRICS Bank," it will be headquartered in Shanghai and given an Indian president. Its board of governors will be chaired by a Russian and its board of directors by a Brazilian. For the past 70 years, the World Bank and the IMF -- the linchpins of the Western-led Bretton Woods system -- have financed economic development and provided balance-of-payment support to indebted countries, respectively. Originally conceived by the liberal economist John Maynard Keynes, the institutions have many shortcomings. They've earned a bad reputation in the developing world for imposing harsh loan conditions on vulnerable countries and for being insufficiently representative of the changing global power balance, particularly with respect to large emerging economies. A special grievance of the BRICS is that the IMF has failed to change the shares of voting power awarded to developing countries, even as they've grown to comprise ever larger percentages of the world economy. The quota system -- that is, the monetary contributions that determine voting percentages in the IMF -- is supposed to reflect the GDP of each country within the global economy. Among the BRIC countries, China and India have been particularly shortchanged, as their voting share has failed to keep pace with their rapid economic development. China, which is responsible for 15.4 percent of the world's GDP, holds only 3.8 percent of the IMF vote. India, with 5.4 percent of global GDP, holds just over 2.3 percent. Reforms to the quota system are badly overdue. And the U.S. Congress recently failed to approve changes in the U.S. share that would decrease it by a miniscule 0.5 percent while still preserving the largest portion of any state (16 percent, where an 85-percent majority is needed to pass reforms). For many developing countries, moreover, the IMF in particular has become more of a cringing last resort than a resource for economic growth. "If you are going to ignore the winners of the global economic game," wrote Dr. Roslyn Fuller, a researcher with the INSYTE Group consulting firm, "and subject the losers…to an impossible web of harsh conditions and crony capitalism, it shouldn't be too surprising that these two camps might someday get together." And that is precisely what's happened. The IMF's inability to keep up is "a permanent sign that global governance is a mess," as former Goldman Sachs asset chief Jim O'Neill puts it. Its legitimacy continues to erode as its more powerful members -- mostly in the West -- have, Fuller observes, "abused their position at those institutions in the service of their own national interests." 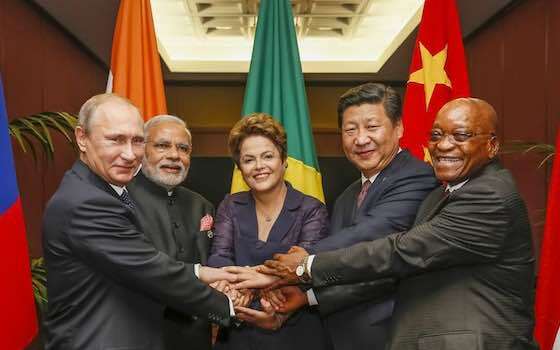 In light of this, a major focus of the new BRICS Bank seems to be properly proportional representation. More significantly, its lending requirements are expected to be quite different from the IMF and World Bank's, since the BRICS economies differ significantly from the developed world's model -- particularly in the cases of China and Russia. This is good news for developing countries for whom the IMF's penchants for currency devaluation, austerity measures, and privatization leave a sour taste. But the Bretton Woods institutions have not been overtly hostile to the new arrangement. The World Bank has even welcomed the BRICS bank, though World Bank president Jim Kim has sought to frame it as a response to developmental challenges within the BRICS countries themselves. The BRICS, he said, have "an enormous infrastructure deficit that simply can't be met by a single institution, certainly not the World Bank in and of itself. So, for us the BRICS Bank is quite a natural extension of the need for more investment in infrastructure." Yet it's not all kumbayas and rosy promises. While the New Development Bank shares equal contributions and voting power, the other new BRICS institution -- the Contingency Reserve Arrangement, with $100 billion in capital -- was largely capitalized by China. This creates a golden opportunity for China to dominate the BRICS much as the West has done with the IMF, potentially consolidating its own interests (such as territorial disputes in the South China Sea) rather than mutual growth. Walden Bello further points out that the BRICS rely on largely export-based economies -- particularly in China, which has led to stagnation and serious growing pains, including increasing unrest over inequality and environmental contamination. How does one developing economy develop another while facing its own issues? This, coupled with suspicion that the establishment of these institutions is based more on the politics surrounding the IMF and the priorities of the BRICS countries than a concern for shared development, sows doubt about the future. Whether the BRICS Bank does end up challenging the hegemony of the IMF and World Bank, assisting in the further need for investment, or falling flat on its face, its presence is a sure sign of shifting power and influence in global finance. If it's successful, it could someday rival the IMF and World Bank as the primary funder for development and assistance. Or at the very least, it could engender some much need competition to increase the efficiency and effectiveness of global development. "A New Global Development Bank in Town"